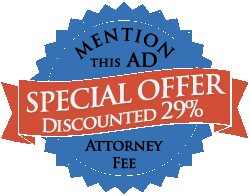 Newsweek has named our commercial truck lawyers “Premier Personal Injury Attorneys 2015.” Pay only when you win. Any car accident is serious. But when you get in an accident with an 18-wheeler the seriousness of the situation increases ten times. The minimum liability insurance most commercial trucks have to carry is $1 million. That means insurance companies will have to pay more – and they don’t want to do that. If you thought insurance companies were feisty about paying for smaller car accident claims, they’re ten times as resistant with commercial truck accidents. 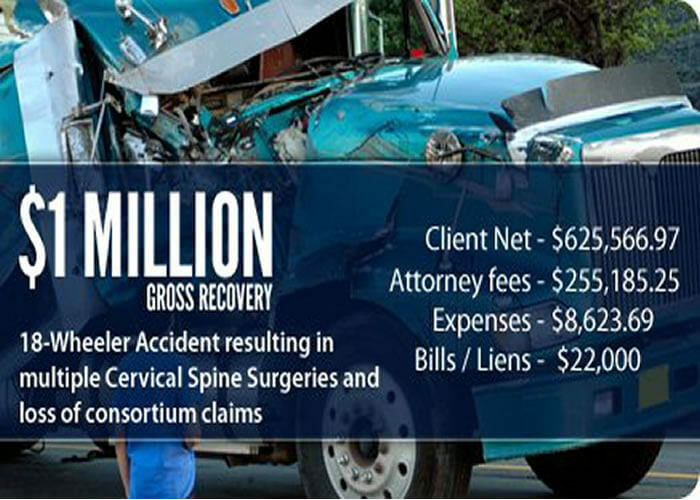 In fact, they’re so serious about minimizing your payout that they have entire departments dedicated to commercial truck accident claims. These departments often hire private investigators to follow you around and film you for months after your accident. So if you claim you have physical injuries, they’re trying to find evidence your claims are exaggerated or falsified. And you can bet they monitor your social media profiles for evidence too. You might never be a movie star, but you’ll feel like one because it is similar to having the Paparazzi follow you wherever you go. 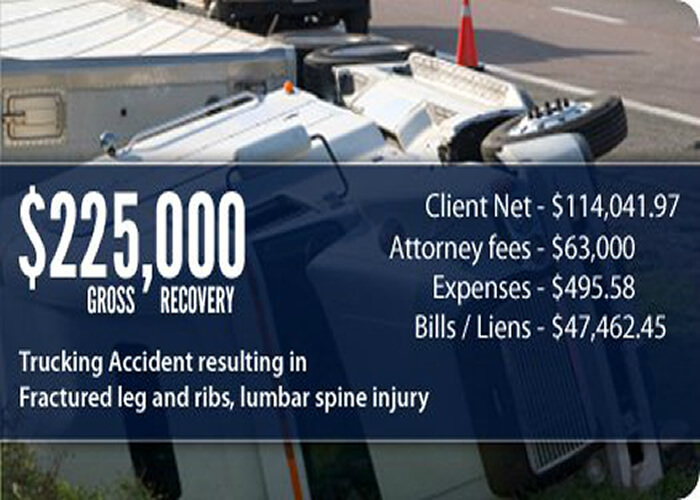 With 18-wheeler accident attorneys, just like any other profession, not all firms operate the same way. For example, you could hire that lawyer you always hear advertising on the radio and TV. But those lawyers run volume practices with tons of clients. You might feel like you’re on an assembly line – just a number. Or, you could go with a small firm, one that takes the time to analyze every detail of your case, gives you individual attention, and where the attorneys themselves oversee, develop, and manage every case. A firm that truly cares about you as a person that has built their practice on maintaining strong relationships and treating clients as family. We want to take as much stress off you as possible, so you can focus on your physical and emotional recovery. When you call our office, you get a prompt response from your attorney – not their paralegal. It’s going to be hard to pay your medical bills. That’s why we can help set you up with medical professionals (doctors, hospitals, MRI facilities) that delay billing until your case settles. You don’t have to worry about piling up medical debt. Our truck accident attorneys have been mentioned in top publications like Newsweek, Thomson-Reuters’ Super Lawyers Magazine, Rue Ratings, and one of the top online lawyer rating services – Avvo (Shane Mullen* and Joseph Morrison*). A look at reviews from prior clients demonstrates the exceptional customer service you can expect from our firm. At Mullen & Mullen, it’s our goal to treat you like a human being, not a number. And we want to make sure the big insurance companies don’t minimize, or completely deny, your claim. Call us at 314-465-8733 (314-INJURED) or contact us to schedule your free consultation today. We’ll discuss the facts of your case in “Plain English,” inform you of your options, our confidence in each, and the realistic results you can expect. It’s just a friendly conversation – there’s absolutely no pressure to hire us on the spot. And of course, you only pay our legal fees when you win your case. What should I do immediately after an accident with an 18-wheeler? Do not say you are sorry, even if it is just to make the trucker feel better. The insurance company can suggest this is an admission of fault on your part, which could reduce your payout. Instead, check and make sure you and your passengers are okay. Then check on the truck driver. As you ask them, turn on your smartphone’s recording function to record what they say. They may admit to causing the accident. Call 911 if anyone is injured – even if the injuries appear minor. Get the name, phone number, driver’s license number, and date of birth from each witness. If a witness is favorable to your position, ask them to make a recorded statement. Should I say I’m injured if I’m just a little sore? Yes. Tell the police and medical personnel you’re sore. If you don’t, and you end up going to the hospital in a couple days, the insurance carrier can use that to show you weren’t really injured in the accident. Do I still have a case if the police officer can’t determine fault? You might. Some witnesses are more credible than others. It’s also possible to utilize trained experts, like accident reconstructionists, to prove your claim. Do the police still need to come to the scene of the accident if I was rear-ended? Yes. Insurance companies can still find ways to deny your claim – even if you are rear-ended. The truck driver can say you stopped your vehicle suddenly, so they had no choice but to hit you. What if I’m in an area of St. Louis where I don’t think the police will come? You should always wait for the police. As you do, photograph the scene of accident extensively with your smartphone. You can’t take too many photos. Consider taking a video and describing your version of events. If the police don’t come, exchange insurance information with the truck driver. Get their name, address, phone number, license plate number, and commercial driver’s license (CDL) number. Also get their employer’s name, address, and phone number. It’s always better to have too much evidence than too little. If you’ve been injured by a commercial truck driver in the St. Louis area, contact our injury lawyers immediately. The longer you wait, the more time the insurance company has to strategize their defense and minimize your payout. Call us today at 314-465-8733 (314-INJURED) or contact us online for your free consultation. The consultation is yours free – there’s absolutely no pressure to hire us on the spot.